The park could be perfect for your next fishing holiday. Surrounded by superb countryside, the attractive village of Trefeglwys provides a wide range of local amenities and activities. With a village shop and pub as well as facilities for walking, cycling, fishing, bird watching, kite feeding and clay pigeon shooting, this charming rural settlement has everything a visitor could possibly need for a relaxing holiday away from the hustle and bustle of city life. Built on the banks of the River Severn, the nearby historic town of Llanidloes boasts a variety of architecture including timber-framed buildings, as well as an impressive old market hall. The town provides everything that Trefeglwys doesn’t, including antique shops, pubs, restaurants and scenic riverside walks. For water sports, the renowned beauty spots of Llyn Clywedog’s 236-foot high dam and the Hafren Forest are close by. Garden Cottage offers the following facilities. Full electric underfloor heating. Microwave with oven, grill and induction hob, fridge, colour TV, DVD player. All fuel and power inc. in rent. Bed linen and towels inc. in rent. Cot on request. Off road parking for 1 car. Grassed area beside chalet with garden furniture and 1/2 acre of shared woods. One well behaved dog welcome. Sorry no smoking. Shop and pub 1 mile. Note: Not recommended for the infirm. Note: Suitable for babes-in-arms only. 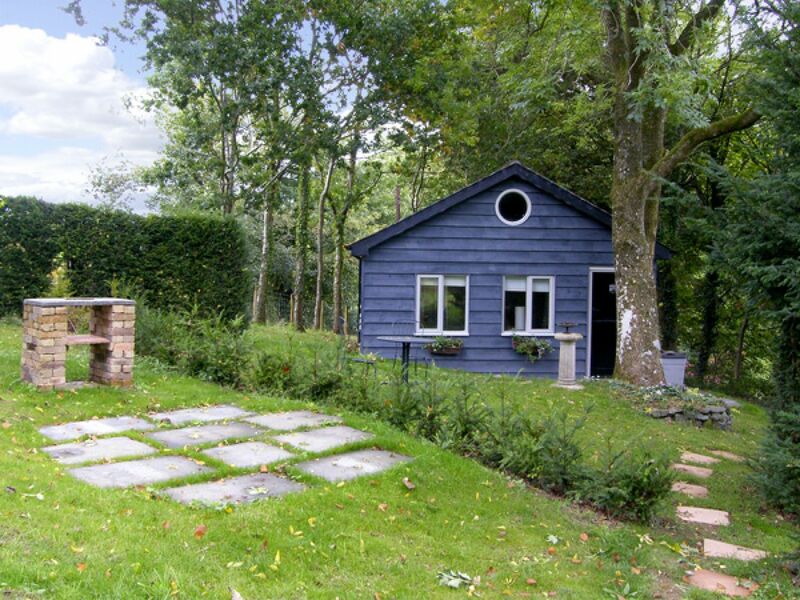 Trefeglwys 1 mile.This attractive detached wooden chalet stands in an acre of wild garden and woods, home to an abundance of wildlife including badgers, foxes and squirrels. The chalet is light and airy and its comfortable and stylish open-plan accommodation, with electric underfloor heating, succeeds in creating a cosy atmosphere, perfect for a romantic break. There is a lawned area with garden furniture. This is a paradise for walking, cycling, birdwatching, fishing, clay pigeon shooting and watersports. Enjoy trips to the Celtica Museum, Hafren Forest, Lake Vyrnwy or the seaside village of Aberdovey - then return to this delightful cottage in its lovely setting. All ground floor.Open plan living/sleeping/dining and kitchen area with double bed (can be made into twin beds by arrangement). Shower room with shower, basin and WC. Have you been to Garden Cottage? Please submit your review so that others can benefit from your experience. Important note: Information provided here about Garden Cottage is based on our best knowledge. However, please check with Garden Cottage before booking to ensure that you have the information required. Reviews are the sole views of the contributor and do not necessarily represent the views of CampsitesandCaravanParks.com or Garden Cottage.